The last thing that Jesus did as a free man was to pray. The last thing in prayed for was that his future followers would get along. 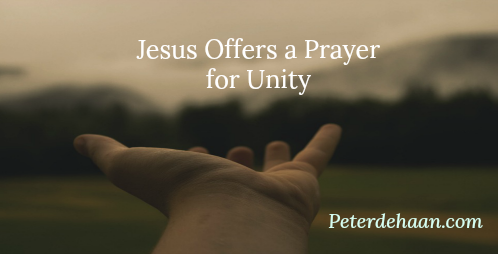 This strongly suggests that unity was important to Jesus. While unity among his followers was largely realized in the first century that has not been the case in the two millennia that followed. The record shows that Jesus’ followers have been increasingly polarized, divided, and strife-filled. Furthermore, the list of essentials should be short. Very short. As short as possible. My list has but one item: to pursue the God who is revealed in the Bible. That is it, nothing more. Everything else is a non-essential and for that I advocate tolerance along with a generous portion of brotherly love. It’s a great first step towards getting along. Cathy, you raise a good question. In looking at the example of Jesus, I see him loving others and not judging them or their actions. For example, when asked what to do with the woman caught in the act of adultery, Jesus forgave her instead of condemning her. The Law said to kill her, but Jesus let her go. May we be able to do the same. Cathy, thanks for your comment. When Jesus summarized the Law, he boiled it down to love God and love others. So I see love as the fulfillment of the Law. yes!!! now I see it–thank you–also–I enjoyed your Faith Manifesto—wonderful! !